Even if people treat our numbers as binary predictions — which, again, they shouldn’t! — most of our high-profile predictions (certainly not all) have been “right” over the years. If we get too much blame when something with a 30 percent chance happens, we also get too much credit when the 90 percent favorite pulls it out, as they will nine out of 10 times. It reflects probabilistic forecasts (Donald Trump has a 67 percent chance of winning Arizona) rather than point estimates (Trump is projected to win by 2.2 percentage points). The vast majority of forecasts that we’ve issued over the years have included probabilities. But there are a few exceptions (e.g., the Academy Awards forecasts we’ve sometimes published), and they are not included in the interactive. It reflects probabilities generated by a formal statistical model designed by FiveThirtyEight. Ad-hoc, one-off predictions are not included in the interactive, even if they took the form of a probability. It reflects forecasts designed and developed by FiveThirtyEight, where we built the algorithm and are responsible for the intellectual property behind it. Forecasts developed and licensed from third parties (and published at FiveThirtyEight) are not included. 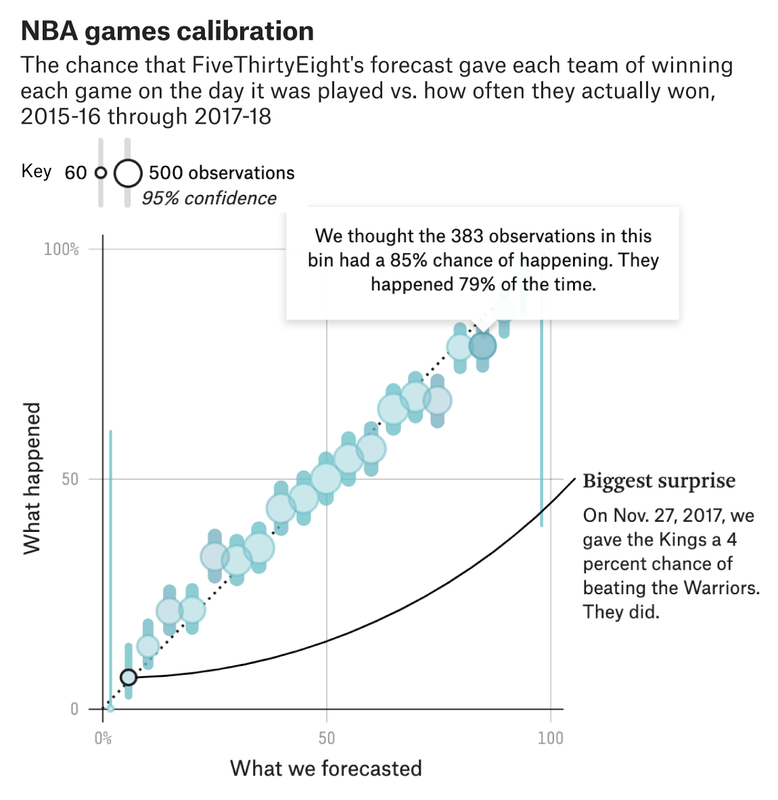 Also, note that all the forecasts included in the interactive were published in real time by FiveThirtyEight in advance of the respective sporting or political event; there should not be any backtested results. Although we’ve issued a lot of forecasts, the sheer numbers slightly exaggerate the volume of what we’ve done because a lot of forecasts are somewhat redundant, i.e., the odds of the New York Mets winning the World Series on May 15 don’t differ much from the odds on May 16, but each one is technically a separate forecast. The statistical techniques that we’ve applied to measure whether forecasts are well-calibrated account for these redundancies. Forecasts from the current NBA season aren’t included yet.